The elegant home digital piano with realistic acoustic sound and a 7" color touchscreen. The Suzuki SDP-2000ts Ensemble Digital Piano is designed for home education, on stage performance and music composing. 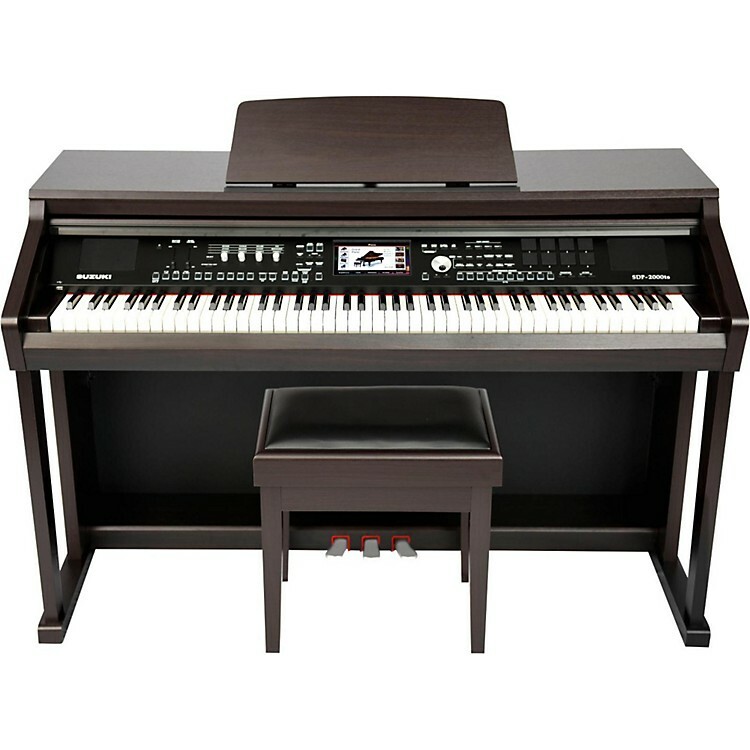 It features a professional graded hammer action, touch sensitive keybed, 128 polyphony, full, rich sound and powerful functions to enhance real time performance and recording. With the internal MP3 playback and Audio Recorder, the SDP-2000ts also brings more fun to your music experience. Maintain complete organizational control using the lighting fast 7" color touchscreen as you go to work harnessing 672 selectable voices, 256 GM voices, 240 rhythm styles and 17 drum kits. 16 track sequencer can store 500 user songs with huge 32GB internal memory USB drive. Add digital reverb, chorus and adjustable graphic equalizer and you start to understand the enormous capability of the new Suzuki SDP-2000ts Ensemble Digital Piano. You are in complete control with a 7" High-Resolution Color Touchscreen. Organize your music and compositions. Download music. Access hundred of ensemble features on the 800 X 480 dot matrix screen. All with high speed and accuracy. Connect the SDP-2000ts to your iPad and convert it into a recording studio. Makes practice and playing time a lot more fun. It's the perfect way to encourage kids to practice. Record your performance, playback hours of prerecorded music files, and create your own music library with songs you download from the internet using any SD Memory Card. Suzuki's acclaimed sound imaging technology and 24 Mb Grand Piano Voice are used to create remarkable depth, expression and realism. 128 note polyphony ensures no dropped notes even with the most complex piano passages. Every high-end digital piano has a few hundred voice selection. On the SDP-2000ts, you can choose from 672 selectable voices, 256 GM voices, 240 rhythm styles and 17 drum kits. Professional styles make you a member of a world-class band of your choice. Mix your voice and rhythm selections to form mind boggling combinations using digital reverb and chorus, equalizer with 4 adjustable graphic faders, arpeggiator, auto bass chord and much more. 16 track sequencer with huge internal 32GB of memory store all your musical compositions. high intensity speakers combine for a masterful performance in sound fidelity. Elegant sound and look, with ultra-modern features!